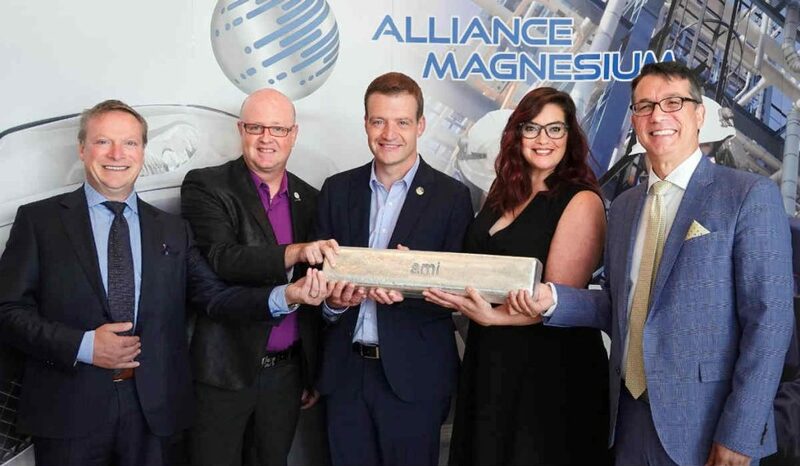 Alliance Magnesium signed a financing agreement with Investissement Québec and the Government of Quebec's Economic Development Fund in the amount of $30.9 million for the construction of its First Commercial Phase at its facility in Danville, Quebec. This investment is part of a $104.9 million financial package that includes other institutional partners. The financing is in the form of a $17.5 million loan and a $13.4 million equity interest. Alliance Magnesium (AMI) is engaged in the production of metallic magnesium and other valuable minerals from serpentine, which is ultimately sold in the markets of the aerospace and automotive industries to reduce their products’ weight. AMI explains it has developed technology and processes that gives it a cleaner and less expensive approach than those currently used by magnesium producers around the world. The magnesium produced by AMI is derived from the recovery of a mining residue and is transformed by a clean electrolysis process. AMI states it has developed a three-step development program that will eventually lead to an annual production of 50,000 tons in 2022 and the creation of more than 250 jobs. The First Commercial Phase will enable AMI to start commercial production of both primary and secondary magnesium totalling 11,700 tons per annum and the ability to sell its products in the North American and European markets. AMI continues to explain this project holds the potential for it become America’s next major producer of metallic magnesium. “Like the large aluminum smelters that have given Quebec its global role as a large producer of light metal with a low carbon footprint, Alliance Magnesium will allow the creation of a new light metals sector that can be complementary to aluminum for alloying purposes in rapidly growing markets worldwide,” stated Michel Gagnon, CEO of AMI. Construction of the First Commercial Phase will begin in the fall of 2018 and will be completed by the end of 2019. The plant will directly hire 63 workers.